According to IMF’ s Global Prospects and Policies report [GPP] — which explores the dramatic escalation of the financial crisis in Sept. ’08 — overall economic stabilization has been elusive as the external environment has continued to deteriorate. From IMF: The policy responses in both advanced and emerging economies have helped alleviate the extreme financial market disruptions observed in October–November 2008, and there have been encouraging signs of improving sentiment since the G20 meeting in early April, but financial market conditions have generally remained highly stressed. …[F]inancial risks have risen further along most dimensions, as discussed in detail in the April 2009 Global Financial Stability Report (GFSR). Most market risk and volatility indicators are still well above ranges observed before September 2008, let alone before August 2007. Although access for high-grade borrowers in securities markets has improved, bank credit growth is falling rapidly across the board.. So far, banks have recognized less than one-third of estimated losses, and substantial amounts of new capital are needed.The GFSR estimates that additional capital would be required (measured as tangible common equity) amounting to $275 billion–$500 billion in the United States, $475 billion–$950 billion for European banks (excluding those in the U.K.), and $125 billion–$250 billion for U.K. banks. restoring market institutions will be protracted. 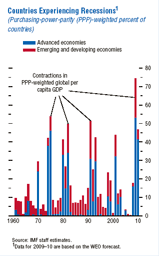 Thus…private credit in the advanced economies is projected to contract in both 2009 and 2010. The global economy is experiencing its deepest downturn in 50 years….In 2009, almost all the advanced economies are expected to be in recession. The degree of synchronicity of the current recession is the highest to date over the past 50 years. Although it is clearly driven by declines in activity in the advanced economies, recessions in a number of emerging and developing economies are contributing to its depth and synchronicity. qualify this year as the most severe global recession during the postwar period. 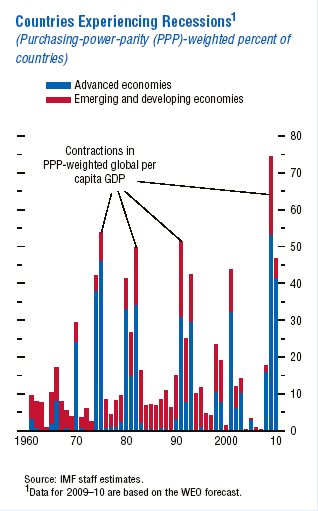 many emerging and developing economies are in recession.